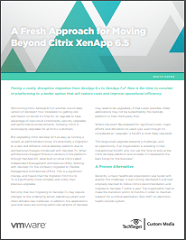 Are you facing a costly, disruptive migration from Citrix XenApp 6.x to XenApp 7.x? Now is the time to evaluate your options and consider re-platforming to a better option that will reduce costs and improve operational efficiency. Download the whitepaper to learn why you should be considering VMware Horizon for your new and improved desktop and application delivery solution. By making the switch to Horizon, for similar effort yet a significantly lower total cost, you can modernize and futureproof your end-user computing environment. VMworld is the premier digital infrastructure event. At VMworld 2018, compute, cloud, mobility, networking, and security innovation all begin with you—the catalysts unlocking value from today’s technologies while anticipating a rapidly evolving high-tech future. Register now!